I liked this movie. Going in, I was expecting a let-down. After all, this is the third time around the block, and even worse, James Cameron (writer/director of the first two Terminator movies) was not involved. 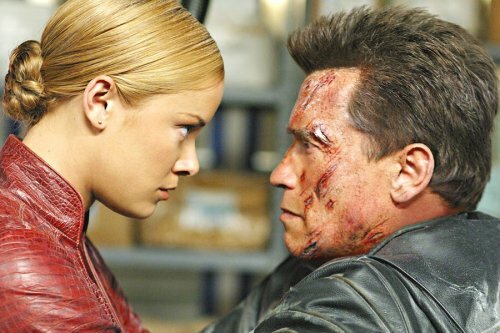 However, the new kid on the block, director Jonathan Mostow was apparently up to the task, because Terminator 3 delivers. The two terminators reach our present time in the same fashion, or, to be more accurate, no fashion at all (they're naked). And the methods that they employ to obtain clothing serve as an entertaining start to the film. Meanwhile, John Connor (Nick Stahl) has been on the run for several years now, severing all ties with his name and with his past. He is running, albeit unsuccessfully, from nightmares which haunt him daily...visions of what is to come. After a motorcycle crash, John Connor finds that he must seek medical attention, but tries to do it alone by breaking into a vet hospital so as not to come in contact with anyone. 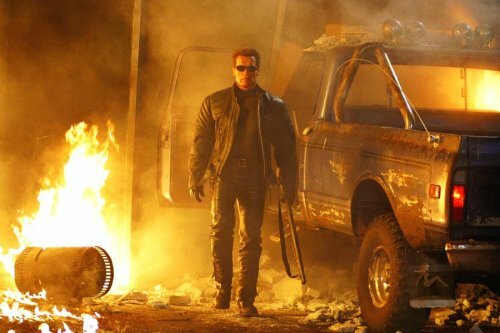 However, a worker at the clinic (Claire Danes) arrives in time to catch him, as do the terminators. This sparks off quite a battle which soon evolves into one of the coolest car chase scenes that I have ever seen! I was pleasantly surprised at the depth of the script as well as the quality of the action. For instance, the script explores different issues with fate and with destiny (such as the fact that John Connor will lead the human rebellion against the machines or that Kate is Connor's future wife), as well as the inevitability of the downfall of man (Judgement Day is coming). And the action is intense, fast-paced, and most importantly, fun. However, I will not fool anyone here, including myself. There were some things lacking in both, especially when compared to the light of T2. First of all, the special effects, though as good or better than those in T2, were not ground-breaking or revolutionary in today's standards. In other words, T2 showed us things we've never seen before, and I really can't say the same for T3. 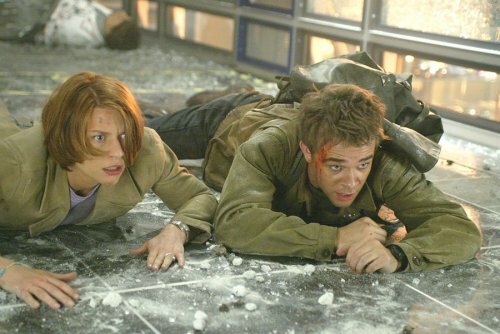 And as for the script, there were a couple of times when I cringed as its sloppiness, such as when John and Kate suddenly happen upon a plane which is their only chance to escape. Kate says something to the effect of, "Hey! This is just like my brother's plane and he taught me how to fly it so let's go!" There was absolutely no mention of her brother or a plane or anything else anytime before this scene. Again, just sloppy. This movie also raises a few questions. 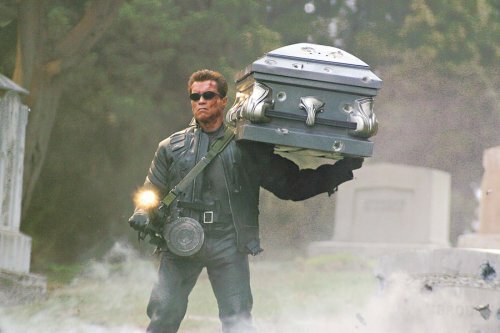 First and foremost, "Why is it that the old, out-dated T-100 (Schwarzenegger) is always able to beat out the more technically advanced Terminators?" My answer to this one is that it is his interaction with humans that allows him to learn and to act in such a way that gives him the edge over the other terminators, who, although more capable, are too artificial and therefore, predictable. Another great Terminator question would be, "Why don't the machines just send back more terminators to the past so that they can get the job done right the first time?" And of course the answer to that question we will never hear because it would mean the end of this successful movie series. However, without getting too philosophical or overly critical, I must again reiterate my enjoyment of this film. It turned out to be a lot better than I expected. It was interesting, exciting, and fun. And you've gotta love those one-liners that Mr. Schwarzenegger always puts out. This time, we'll all be sure to remember the following: "Talk to the hand." and "You are terminated." 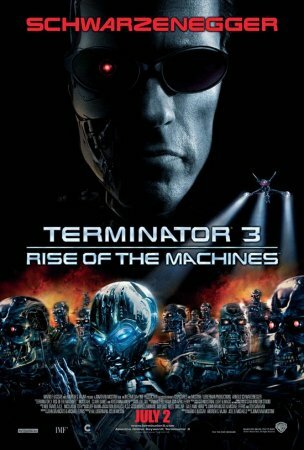 How would you rate the movie Terminator 3: Rise of the Machines? There have been 17413 people to visit this page since Fri, Jul 4, 2003. And you are the first person to visit this page today!